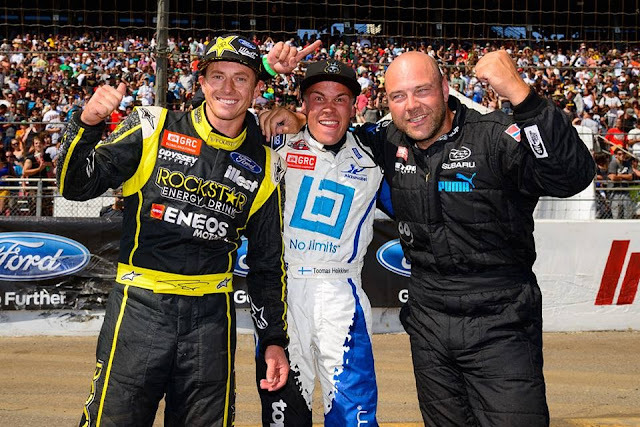 Rally Racing News Leader in the USA | Rally World News Rally World News: Heikkinen Takes Gold to Clinch The 2013 GRC Championship for Ford at Summer XGAMES . Heikkinen Takes Gold to Clinch The 2013 GRC Championship for Ford at Summer XGAMES . Fans come to their feet for the start of the Supercar final at the House of Drift, this was the first time back to Irwindale for the GRC since 2012. Los Angeles, August 4, 2013. 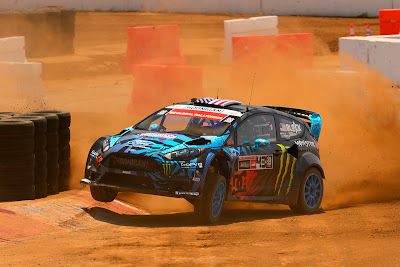 The dominance of Toomas Heikkinen in the 2013 Global RallyCross [GRC] continued this weekend at the 2013 Summer XGames. Despite getting momentarily caught up in the first turn mayhem, Topi basically checked out with his #57 OlsbergsMSE Ford Fiesta ST and drove a flawless race to his forth consecutive GRC victory while also collecting a forth XGAMES medal in 2013. 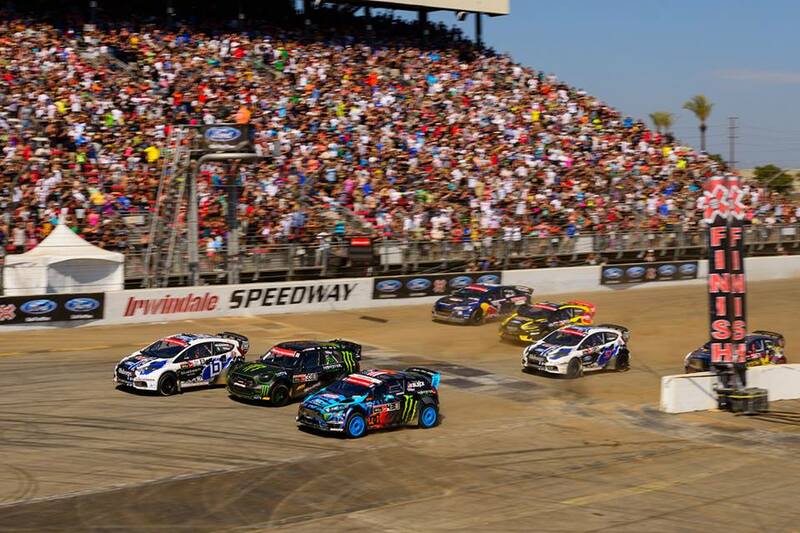 GRC is finally looking a lot like real RallyCross, the track layout at Irwindale speedway was less focused on a big jump but more on a track that tightened in all the right places, creating some great door to door racing and passing in the dirt sections. The Final got off to a roaring start with an overzealous Sverre Isachsen jumping the start, for which he was black flagged for, but the jump start seen Isachsen leading into the first turn, and he was out in front avoiding the mayhem that unraveled behind him. All hell broke loose behind Isachsen, watching it live it was and still is hard to cast blame on any one driver. You can decide for yourself with the unlimited rewinds available on YouTube. How we see it, Ken Block gets into a big drift around turn one, Ken and Topi come together for a few seconds, Ken then comes down the track and collides with fellow Monster Energy driver Liam Doran in the Mini, who was coming up on the inside line. At this point there seems to be little if any damage to the cars, just some tight racing and rubbing. It seemed like Liam Doran then turned right into Block, retaliation for the earlier contact? well things just unraveled from there. Block spins in front of Doran, Heikkinen barges into Block helping to spin him around. Brain Deegan also gets caught up in the pileup and retires. Patrik Sandell tries to slip up the inside and ends up going crashing into the water barriers. Somehow Toomas Heikkinen slips through virtually unharmed into the first hairpin, Tanner Foust is alongside his door, with Travis Pastrana kissing his rear bumper. Block gets the RX43 re fired but has a rear flat and some heavy rear suspension damage. Always the showman, Block does a few laps burning the tires off the car for the fans before pulling off the track, thus ending a very disappointing XGAMES for HooniganRacing. Subaru’s Sverre Isachsen went all out on the first lap, knowing full well he had to open a gap to negate the impact of his stop and go penalty. Sverre is passed by Heikkinen, Foust and Travis Pastrana while he sits in the penalty box. Tanner sets his sights on Heikkinen while Sverre went to work on chasing down Pastrana for third, or more important, the XGames bronze medal. It may have taken Vermont Sports Car a few races to get their car up to speed, but they definitely had Isachen’s STI dialed in for XGAMES. It only took Sverre one lap to reel in the Red Bull Dodge of Pastrana, his Puma sponsored Subaru sailed past Travis in the dirt section on the 3rd lap. Subaru is not alone in their frustration in tracking down the Ford Mafia in 2013, Travis Pastranan’s Dodge team has yet to podium in 2013. Bryce Menzies did not make the final after putting his Dodge in the wall in the LCQ. The Dodge Dart seems big and cumbersome compared to the high energy Fiesta’s, , , Travis also seemed to have no answer for the Subaru as it sailed past, Pastrana’s hopes for a podium and a medal faded to grey in the early laps. Scott Speed would also put his Fiesta into the wall in the final allowing Rhys Millen to move into 5th behind Pastrana, this was Millen only showing in GRC in 2013 as Hyundai pulled out of rallycross at the end of 2012. Off the front it was all Heikkinen, the Flying Finn barely put a tire wrong as the laps clicked down, Tanner Foust closed the gap on several occasions, but it was like Heikkinen was just toying with Foust as he seemed to be able to pull away at will. Tomas Heikkinen center flanked by Tanner Foust, [left] and Sverre Isachsen as they celebrate their victories at Summer XGAMES 2013. In the end it was all Heikkinen in the BlueBeam/ Fordracing Fiesta ST, Tanner Foust who’s Fiesta is also prepared in the same OlsbergsMSE shop in CA, slides through in second for the Silver.” It’s cool! It’s cool to have a lot of points” proclaimed Heikkinen as he stood on the roof of his Fiesta at the finish line, “Still we’re leading, and now we have a little bit less pressure, but the next race is in six days, and we have work to do. I think the gap opened a little bit, because Tanner didn’t win his heat and I got the one extra point, plus three points more in the final. (Since last year) I just made my own work, what I had to do. I exercised at home and the gym to get myself ready for this season. Everything is good right now, and I’m not doing anything else than smiling”. With the podium finish by Heikkinen and Fousts at XGAMES, they clinched the 2013 GRC Championship for Ford Racing. With 39 point lead over Tanner Foust in second; the championship is Heikkinen's barring a disaster. I would also hate to see Topi, easing back and letting someone else win for the sake of the sport, he should go for the win and let the chips fall where they will. Subaru’s front man in the GRC, Sverre “The Viking Warrior” Isachsen finally, finally got the monkey off the teams back by holding Pastrana at bay, to bring his Subaru STI home and third. This is the first XGames medal and GRC podium for Subaru in 2013. “It was awesome! I had a good start. They said it was a jump start” proclaimed Sverre after the final “but anyway, we sat in the penalty box, took our punishment, and then went back in the race. It was a perfect race the whole way. Third place today is like winning for us at Subaru. Of course we’ll go for it in Atlanta as well. We’re taking the car small steps at a time and hopefully can try to get to the top”. Without question the carnage that is happening in the GRC is unlike anything in any other form of professional motorsport around the world. But if the goal of the organizers was to create excitement, check that box already, it sure is exciting for the fans. We also need to remember that is a made for TV series, and is directed in the background by a TV schedule. Despite the frustration of drivers that are left licking their wounds after getting taken out in the first turn, the racing “seems” to continue to gain momentum, there is talk of Chevy and others planning to campaigning cars in 2014. As for the remaining rounds of the GRC in 2014, with the Championship in the bag for Ford we expect to see a reduced field over the final two races, which will be held in Atlanta and Charlotte. We also expect to see organizers tweaking the rule book, or should I say begin to write a rulebook. Either way, stay tuned this is by far the most exciting new form of racing happening the USA at this time.